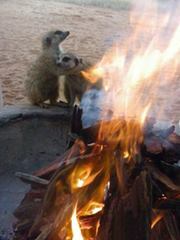 Here is the story of 2 baby meerkats (orphaned) and the people at Kalahari Trails (Anne Rasa and Andre) who adopted them. 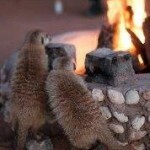 23 March 2012 – I was brought 2 tiny baby meerkats by the bushmen 2 days ago that had found them in the veldt. Something must have happened to their mother.They were very traumatised for the first day but are now doing fine but are taking up nearly all my time. If I`m not there they scream”Baby Lost” at the tops of their voices, this is like a high-pitched yap that goes through your ears like a needle. I`ve finally got them feeding on insects and tiny pieces of meat but they need to be fed about every hour or so. The little male is a “mother`s boy” so I`ve called him Kaspar (after Kaspar Milquetoast the comedian) and the little girl I`ve called Kirri. 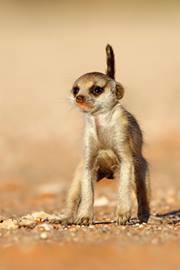 A kirri is a walking stick used by the bushmen and, in Afrikaans, meerkats are called `stick-tailed meerkats` to distinguish them from `fan-tailed meerkats` the ground squirrels. 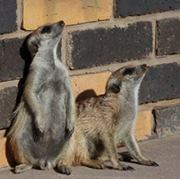 So Kirri is a good name for a meerkat. I`ll be posting some photos soon, so watch this space. 26 March 2012 – Little Kaspar says “Come play with me. 22 April 2012 – Here`s another of Sarie`s photos of the babes when they were about 7 weeks old. Kirri fell off a wall of all things and hurt her leg, so she`s limping a bit. Both of them are now able to locate and dig up beetle grubs and both have passed my night course “Moth Catching 101”. Kaspar still tends to get so excited when he pins a moth with his paws that he squashes it so thoroughly, he can`t find it any more. Yesterday with all the wind, we had about 15 vultures soaring overhead. The babies had a fit and stayed stock-still, staring at them until they were out of sight. They know very well from where danger comes! 26 April 2012 – Winter is on its way and Kaspar and Kirri have already got their fur coats on to meet it. Sunning your tummy is a great way to meet the day! 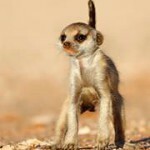 4 May 2012 – Its hard to run when your pesky brother`s hanging onto your tail! 13 May 2012 – The babes are growing up fast. Andre took this lovely portrait shot of Kirri stretched out and basking in the sun. Kaspar, as usual, was busy digging around somewhere. 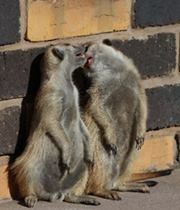 That mongoose never stops! Talk about hyperactive! 21 May 2012 – Little Kaspar says: This is what I call a REAL take-away – food with a handle! My friend Naas Rauthenbach took this super photo of Kaspar and his afternoon scorpion while he was here in late April. 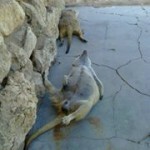 19 June 2012 – .Aaah, I see our other pack members have already started one! There`s nothing quite like sitting around a campfire, watching the flames and warming yourself on a chilly winter evening. 4 August 2012 – Don`t cry Kaspar, please don`t cry. They were only joking. They`re not REALLY going to roast you – even though you HAVE got a bit pudgy! 16 August 2012 – “LOOK!! UP IN THE AIR!! IT`S A BIRD!! IT`S A `PLANE! ITS … (wait for it) …. SUPERMEERKAT!! 18 August 2012 – Kaspar and Kirri, with visibly bulging tummies, say a special “Thank you” to our friends Ursula and Manfred Rose. They brought them a WHOLE KILO of dried mealworms, all the way from Germany, when they came to visit us. Its quite a bit less than a kilo after this feast! Little delinquents, spoilt rotten! 24 August 2012 – No, Kaspar and Kirri have not suddenly turned vegetarian. What you see here is a blatant case of BLACKMAIL! If we ignore them when they start their continual food-begging around midday, they`ve learned that the quickest way of getting our immediate attention is to rip up the vegies. Intelligent delinquents! 17 September 2012 – Poor Kaspar has been in the wars. One of our guests accidentally trod on him and broke his foot. He is taking full advantage of the situation, demanding lots of TLC and, of course, food. This is one mongoose that is going on a slimming diet with lots of exercise as soon as he can walk properly! Despite his injury, Kaspar is still as clownish as ever. Kirri seems to know that he`s hurt and grooms him every chance she gets, much to his annoyance sometimes. However, it doesn`t prevent them from contesting over every little thing, edible or not, that comes their way – like this leaf. There`s nothing quite like sibling rivalry! 27 September – Kaspar fans will be glad to hear that he is now FINE! He is running around, digging and playing as if nothing had happened. He still has a hard lump on the inside of his back leg `ankle` where the break was, but, from experience, I know that will disappear in the next weeks. 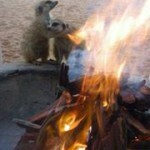 Meerkats are really tough little creatures! 7 October 2012 – Kirri at her self-imposed task of `guarding` us against nasties (Kaspar can`t be bothered). She is excellent at spotting raptors, though, and tells us when there`s one overhead. 16 October 2012 – Now the weather has started warming up, serious “tummy sunning” doesn`t last long before it turns into bickering play. Poor Kirri! Her nose was in just the wrong place as far as Kaspar`s sharp little teeth were concerned. Their skins are so tough, though, that nips like this don`t seem to bother them at all. 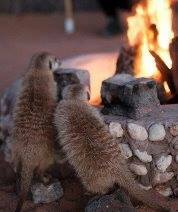 26 October 2012 – DO YOU WANT TO KNOW HOW HOT IT GETS IN THE KALAHARI?? Get yourself a meerkat thermometer. Above 25 degrees, meerkat lies on belly. 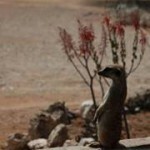 Above 30 degrees, meerkat lies on back. 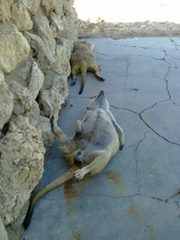 Above 35 degrees, meerkat lies in shower! It`s easy when you know how. 28 October 2012 – POOR KASPAR HAS BEEN IN THE WARS YET AGAIN! We have just awarded him a “Purple Heart” for being wounded in battle. A wild group came out of the veldt and attacked him and Kirri. Kirri, being a female and clever, disappeared. Kaspar tried to `war dance` but 8 opponents were too much. He beat a hasty retreat into the lodge, followed by the wild group, which just ignored Andre and streamed past him, finally catching Kaspar as he was trying to squeeze under a sofa in the lounge. Of course it had to be his bad leg that was “sorely wounded” again. Here he proudly displays his injury. 4 November 2012 – OH DEAR! 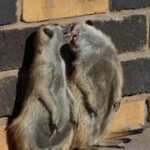 Andre really shouldn`t have told Kirri that Western Province, her favourite team, won the Rugby Cup this weekend. She got at the brandy again and passed out cold. What a disgrace!